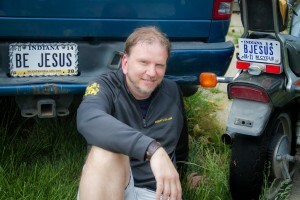 Rusty Edwards, a member of Grace Community Church, a Grace Brethren church in Goshen, Ind. (Jim Brown, pastor), wrote on his Facebook page this week about riding his motorcycle through the rain from Warsaw, Ind., to his home in Goshen, about 25 miles away. It is included here with his permission. SO I SAW JESUS again last night. As I’m sitting on the porch watching this storm it reminded me of my near death motorcycle ride in last night’s storm coming back from Warsaw. I’ve got many stories of moments when the Lord has revealed Himself and this is just one. After work yesterday I discovered my oldest daughter, Laramie had taken her brother and sister on an adventure to Warsaw’s Central Park Beach to beat the heat and frolic in the water. I’m always up for an adventure so of course I hopped on my motorcycle and took off. After playing with the kids for a few hours, the radar alerted that a storm was coming so after stalling as long as I could I finally took off, hoping I’d beat the impending cloud formations that had already darkened the sky. I was wrong- and I had just left the north side of Warsaw as the storm hit like a freight train. I lasted all of three miles and was almost blown over three times before I finally gave in and pulled over hiding behind a warehouse hoping the storm would pass quickly. I knew my kids had already passed me on their way home and since I gave them my phone I was pretty much stranded. After about 25 minutes I decided to “take my chances” and ride in the rain despite the inherent dangers. Now for posterity I’m compelled to mention that I’m riding an old beat up Honda Magna with a very bald back tire and I’d already promised myself I’d never ride it even with dew on the ground let alone trying to ride in a torrential downpour. Nonetheless I talked to the Lord and asked for safety and that the Lord would be with me on my way. He’s always faithful and this time, He paid me a visit. As I’m riding in the dark going maybe 35 mph with rain pelting me and the wind trying to knock me over, I could tell I was a little rattled as I noticed my white knuckles holding the handle bars. After the first oncoming semi drenched me with a wall of water I knew it was not going to be a pleasant ride. Suddenly, out of the darkness and quite to my surprise another motorcycle appeared beside me with a guy that kinda’ looked like [the musician] Bon Jovi, wearing red and black, smiling at me. It was both frightening and surprisingly reassuring at the same time. We rode side by side for quite some time and although I’m sure with his fancy black and red motorcycle with nice tires, he could have gone much faster, but he stayed with me for quite a while. Not much else was said as we both concentrated on the road and he rode alongside me about half-way home before he suddenly disappeared into the darkness again. I never got his name and that happens sometimes. But I knew it was Jesus because in the midst of the storm I had peace when he was riding beside me. With all that fear of crashing and thoughts that my kids would be worried if I didn’t make it home in a reasonable time, everything was better when Jesus was cruising in the same storm, and taking the same risks, right beside me. And so it was, I finished the rest of the ride home still going only 35mph, still soaking wet from the rain, but I actually enjoyed the last half of the journey because I just knew it was going to be okay. This story first appeared in the GraceConnect eNews. To subscribe to the newsletter, click on the orange button on the upper right of this page. At risk of sounding (exposing that I am) dense, I can't quite grasp the author's tone. Is he suggesting a literal appearance of Christ? Or is he suggesting that the companionship of a stranger for a period of time brought him a comfort and reminder of the abiding of Christ? Sorry if that sounds nitpicky. It just greatly effects the way I read this article.